Grace is not a film where there’s tons of blood and gore for no reason. It’s not that type of horror film. This one is much more cerebral. Grace is creepy. It’s also feminist to its core. People are talking about Jennifer’s Body before it has even been released [that is written by Diablo Cody and directed by Karyn Kusama and stars Megan Fox]. Although written and directed by a man, Paul Solet, Grace manages to tap into feminist ideals. It hones in on a woman’s bond with a child. How far is a woman willing to challenge morality to provide her baby with the most basic of needs: food, shelter and safety? For a long time, new-agey vegan and women’s studies graduate Madeline [Jordan Ladd] and her husband Michael [Stephen Park] have been trying to have a child and finally Madeline gets pregnant. Everything seems to be going quite well although Michael’s mother does not approve of the choice of a midwife for the birth and giving birth in a birthing pool instead of at a hospital. The midwife is actually Madeline’s former professor and lover. After a terrible accident, both her husband and the fetus she’s carrying die. She, however, decides to carry the baby to term. After the stillborn birth, the baby suddenly comes back to life. She names her Grace. Nothing terribly bizarre happens to Grace. She just has an insatiable appetite . . . for blood. Thus the creepiness ensues. Bugs are drawn to her. The cat is overly protective of the baby. And when Madeline breastfeeds Grace it is the ultimate horror show. A complete nightmare. In the end, though, Madeline will go to any means necessary to give her baby what she needs and to hide this fact from her mother-in-law and any one else who would take her child away from her. Ladd is excellent in her transformation from the easy-going, hippie chick to the anemic, obsessed, and unwaveringly devoted mother. 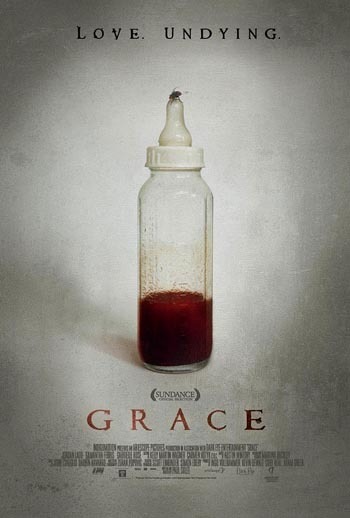 Grace is truly disturbing and will make you think for days after you watch it. This entry was posted on September 16, 2009, 06:15 and is filed under DVD, Film. You can follow any responses to this entry through RSS 2.0. Both comments and pings are currently closed.